The front camera of this phone is good enough to provide crisp and clear selfies and the storage of this device is sufficient enough to store a big amount of images, videos and kinds of music, Samsung Galaxy A8 2018 have a decent processor and RAM management is very good while you do multitasking with this device. Warning:- This method is only for the Samsung A8 device owner. -First of all, download some of all the required files to your computer. before you try to SM-A530F FRP Remove you need to download the latest Combination file and latest Stock Firmware also FRP tool with USB Driver. -Once you downloaded all the files to your PC, then you need to download the latest Firmware file that helps you recover your device. -Once you downloaded Combination Firmware” just Extract files on your Computer. -Then open the Extracted folder – there you will able to see 1 file. Lets Flash Combination Rom with Odin tool to Bypass FRP Samsung A8 2018. -Select the Combination Files there. -Click AP- Give the file path of the extracted combination file folder [File On Extracted ‘Combination Rom’ folder]. -Using-Press and Hold Volume Up & Down+Power Key. When Boot Your Device Release All Keys…Now Next Step to Confirm -Press Volume Up Key to Confirm Download Mode}. -Now you will see on Odin tool “ID.COM” turn into Blue Color. -When its finish flashing – then you will show Pass message. -Once combination file is flashing done, then your next step is SM-A530F FRP Remove. -After that, go to settings by swipe your finger up to down to bring Notification menu. -Then click on the gear icon from there. -After that, go down to the About device. -After that, tap on the “Build Number” 5-7times. -Then go back to the “settings” main menu. -Go down and check “Developer Option” will be added there. Note:- If there “OEM Unlocking” option will not visible, then enable the “USB Debugging Mode” only and then download the “ADB FRP” tool and connect your device to PC. then run the tool, press “OK” on your phone, then close and reopen the tool to successfully Bypass FRP Samsung A8 2018 from your device. -Now you are only one steps away to SM-A530F FRP Remove. just flash the latest version stock firmware that you downloaded before. -Now extract the Stock Firmware On your Computer. that you downloaded from “Sammobile” website. -To enter into the download mode, Press, and Hold (Volume up+ Volume Down). then connect USB Cable. -When Boot Your Device Release All Keys…Now Next Step to Confirm -Press Volume Up Key to Confirm Download Mode. -Do not select the “CP” file on the Odin tool. -Click the “Start” button to start flashing your device. -Then power On your Samsung device. -complete the initial setup of your device. 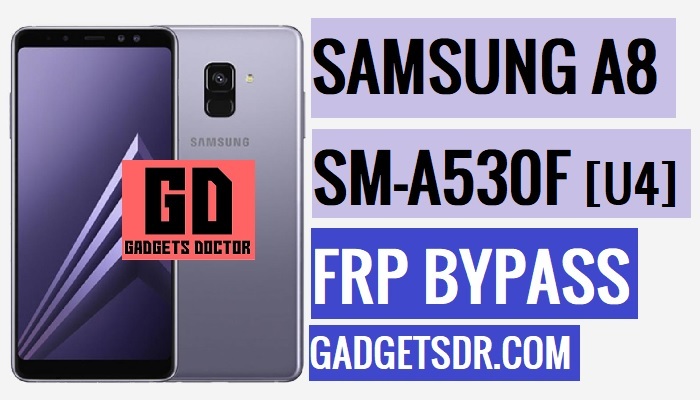 -Now you have successfully Bypass FRP Samsung A8 2018. Thanks for visiting us, Comment below if you face any problem With (SM-A530F FRP Remove), we will try to solve your problem as soon as possible. you can check other some tutorial here to help you.